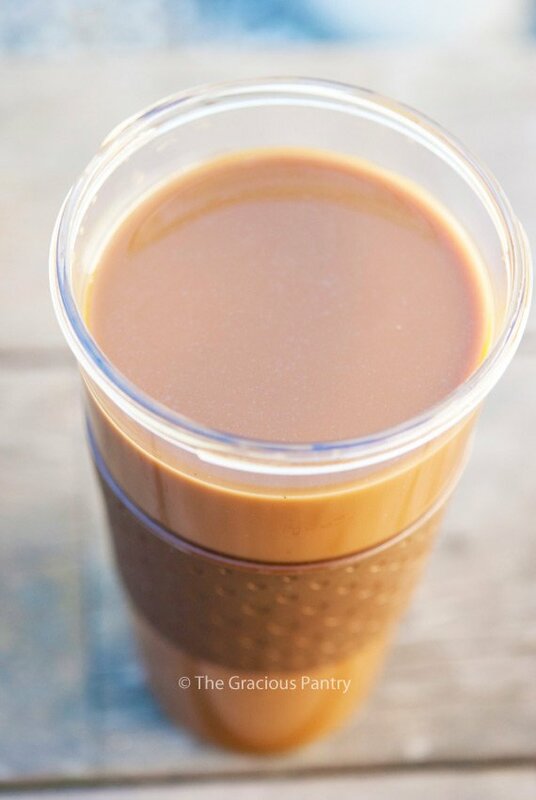 This clean eating coconut latte is the perfect, dairy free start to your morning! I have to admit, lattes are a weakness. Decaf or fully leaded, I just love the flavor. I even have this one cup, pictured above, that I drink them out of. In fact, it’s just not a latte if I don’t drink it from that cup. It’s this whole little ritual I have. Maybe I should be concerned by this odd behavior, but I’d rather just enjoy my latte. Since I gave up dairy (and boy has that been a bumpy ride! Ha! ), I have relied more and more on the use of light coconut milk in cooking. So I figured, why not try it in my coffee too. Holy moly!! I didn’t know coffee could be that creamy without real cream! I have to admit, however, that this recipe falls in to the “not-really-sure-you-can-call-this-a-recipe” category simply because it’s so adjustable. Which is why I won’t be giving you any measurements. Hence, the not-really-sure-it’s-a-recipe thingy. But you tell me! Give it a try! A delicious, dairy free start to your morning! Mix everything together to your liking! Please note that the nutrition data is not available for this recipe. This recipe from the Gracious Pantry archives, originally posted 12/9/11. LB – Interesting! I’ve never had that happen. What type of coconut milk did you use? L Breaux – It may have been some of the fat settling on top as well. That brand tends to have a bit more fat in it than the Trader Joe’s brand. Both excellent brands, but it may indeed act differently than the brand I use from Trader Joes. Glad you enjoyed it! Diane – If it doesn’t bother you, enjoy it! I miss it terribly! Stephanie – I hope you enjoy them both! Hilliary – Give it a try! Definitely very warming! Teresa – Haha! And I’m sure it doesn’t just SEEM better in your cup, it probably IS better! I swear that’s how it works with my cup! Haha! Patty – This one is better warm. The pumpkin latte you can do either way. Enjoy! Wolf – No worries! I buy the canned variety. The stuff in the carton has way too many added ingredients, most of which are not clean. At least in my experience. I get the canned, light coconut milk from the ethnic section of the store. I think even walmart sells it now! Thank you so much! I can’t wait to try this now! Wolf – Hope you enjoy it! I use canned also. Trader Joes seems to have the best prices for light coconut milk (99 cents a can compared to over 2.00 per can that all my local grocery stores charge!) So I always stock up when I make a trip to TJ’s. This sounds really amazing. 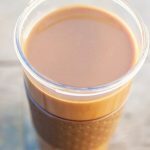 I LOVE coconut and coffee and this sounds like an absolutely delightful alternative to the uber sugary and pricy drinks at Starbucks and Coffee Bean. I can’t wait to try it! How does honey go with coffee? Never tried, but curious to give it a go. I just have a few doubts about the taste combination… Do you ever use agave to sweeten your coffee? I have never tasted agave, but that is certainly another thing to try on asap. Agave is processed. Not clean. I love honey in my coffee. I thinks it’s wonderful, but you’ll have to try it and see if it’s something you like. will try this one in my freezie makers too!! Pipsa…with the coconut milk you might not even need the sweetener!! give it a try!! Am I correct in assuming that you usually order lattes with the full fat milk? The coconut milk is pretty darn rich and creamy, especially if you use the full fat variety. But I tend to use the light version far more often. I find it to be creamy enough without all the added fat (even if it is healthy fat). It could also depend on the type of coconut milk you are using. If you use the stuff in the refrigerated carton, it will never be creamy enough. You need to use the stuff in the can. The pure stuff. It makes a huge difference. No, but it sounds like a fun project! Thanks! Just had this, and shared your blog link on my Facebook Page! This is amazing! Thank you so much for sharing this! Am becoming a bit of a Graciouspantry stalker! I just tried this recipe and it was DELICIOUS. Thanks so much for sharing.